Y. pestis is a nonmotile, stick-shaped, facultative anaerobic bacterium with bipolar staining (giving it a safety pin appearance) that produces an antiphagocytic slime layer. Similar to other Yersinia species, it tests negative for urease, lactose fermentation, and indole. The closest relative is the gastrointestinal pathogen Yersinia pseudotuberculosis, and more distantly Yersinia enterocolitica. The complete genomic sequence is available for two of the three subspecies of Y. pestis: strain KIM (of biovar Y. p. medievalis), and strain CO92 (of biovar Y. p. orientalis, obtained from a clinical isolate in the United States). As of 2006, the genomic sequence of a strain of biovar Antiqua has been recently completed. Similar to the other pathogenic strains, signs exist of loss of function mutations. The chromosome of strain KIM is 4,600,755 base pairs long; the chromosome of strain CO92 is 4,653,728 base pairs long. Like Y. pseudotuberculosis and Y. enterocolitica, Y. pestis is host to the plasmid pCD1. It also hosts two other plasmids, pPCP1 (also called pPla or pPst) and pMT1 (also called pFra) that are not carried by the other Yersinia species. pFra codes for a phospholipase D that is important for the ability of Y. pestis to be transmitted by fleas. pPla codes for a protease, Pla, that activates plasmin in human hosts and is a very important virulence factor for pneumonic plague. Together, these plasmids, and a pathogenicity island called HPI, encode several proteins that cause the pathogenesis, for which Y. pestis is famous. Among other things, these virulence factors are required for bacterial adhesion and injection of proteins into the host cell, invasion of bacteria in the host cell (via a type-III secretion system), and acquisition and binding of iron harvested from red blood cells (by siderophores). Y. pestis is thought to be descended from Y. pseudotuberculosis, differing only in the presence of specific virulence plasmids. A comprehensive and comparative proteomics analysis of Y. pestis strain KIM was performed in 2006. The analysis focused on the transition to a growth condition mimicking growth in host cells. Numerous bacterial small noncoding RNAs have been identified to play regulatory functions. Some can regulate the virulence genes. Some 63 novel putative sRNAs were identified through deep sequencing of the Y. pestis sRNA-ome. Among them was Yersinia-specific (also present in Y. pseudotuberculosis and Y. enterocolitica) Ysr141 (Yersinia small RNA 141). Ysr141 sRNA was shown to regulate the synthesis of the type III secretion system (T3SS) effector protein YopJ. The Yop-Ysc T3SS is a critical component of virulence for Yersinia species. Many novel sRNAs were identified from Y. pestis grown in vitro and in the infected lungs of mice suggesting they play role in bacterial physiology or pathogenesis. Among them sR035 predicted to pair with SD region and transcription initiation site of a thermo-sensitive regulator ymoA, and sR084 predicted to pair with fur, ferric uptake regulator. Several species of rodents serve as the main reservoir for Y. pestis in the environment. In the steppes, the natural reservoir is believed to be principally the marmot. In the western United States, several species of rodents are thought to maintain Y. pestis. However, the expected disease dynamics have not been found in any rodent. Several species of rodents are known to have a variable resistance, which could lead to an asymptomatic carrier status. 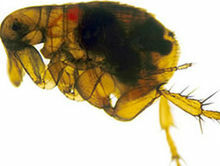 Evidence indicates fleas from other mammals have a role in human plague outbreaks. The lack of knowledge of the dynamics of plague in mammal species is also true among susceptible rodents such as the black-tailed prairie dog (Cynomys ludovicianus), in which plague can cause colony collapse, resulting in a massive effect on prairie food webs. However, the transmission dynamics within prairie dogs do not follow the dynamics of blocked fleas; carcasses, unblocked fleas, or another vector could possibly be important, instead. In other regions of the world, the reservoir of the infection is not clearly identified, which complicates prevention and early-warning programs. One such example was seen in a 2003 outbreak in Algeria. The domestic house cat is susceptible to plague. Their symptoms are similar to those experienced by humans. Cats infected with plague can infect people through bites, scratches, coughs, or sneezes. The transmission of Y. pestis by fleas is well characterized. Initial acquisition of Y. pestis by the vector occurs during feeding on an infected animal. Several proteins then contribute to the maintenance of the bacteria in the flea digestive tract, among them the hemin storage system and Yersinia murine toxin (Ymt). Although Ymt is highly toxic to rodents and was once thought to be produced to ensure reinfection of new hosts, it is important for the survival of Y. pestis in fleas. The hemin storage system plays an important role in the transmission of Y. pestis back to a mammalian host. While in the insect vector, proteins encoded by hemin storage system genetic loci induce biofilm formation in the proventriculus, a valve connecting the midgut to the esophagus. Aggregation in the biofilm inhibits feeding, as a mass of clotted blood and bacteria forms (referred to as "Bacot's block"). Transmission of Y. pestis occurs during the futile attempts of the flea to feed. Ingested blood is pumped into the esophagus, where it dislodges bacteria lodged in the proventriculus and is regurgitated back into the host circulatory system. Pathogenesis due to Y. pestis infection of mammalian hosts is due to several factors, including an ability of these bacteria to suppress and avoid normal immune system responses such as phagocytosis and antibody production. Flea bites allow for the bacteria to pass the skin barrier. Y. pestis expresses a plasmin activator that is an important virulence factor for pneumonic plague and that might degrade on blood clots to facilitate systematic invasion. Many of the bacteria's virulence factors are anti-phagocytic in nature. Two important anti-phagocytic antigens, named F1 (Fraction 1) and V or LcrV, are both important for virulence. These antigens are produced by the bacterium at normal human body temperature. Furthermore, Y. pestis survives and produces F1 and V antigens while it is residing within white blood cells such as monocytes, but not in neutrophils. Natural or induced immunity is achieved by the production of specific opsonic antibodies against F1 and V antigens; antibodies against F1 and V induce phagocytosis by neutrophils. In addition, the type-III secretion system (T3SS) allows Y. pestis to inject proteins into macrophages and other immune cells. These T3SS-injected proteins, called Yersinia outer proteins (Yops), include Yop B/D, which form pores in the host cell membrane and have been linked to cytolysis. The YopO, YopH, YopM, YopT, YopJ, and YopE are injected into the cytoplasm of host cells by T3SS into the pore created in part by YopB and YopD. The injected Yops limit phagocytosis and cell signaling pathways important in the innate immune system, as discussed below. In addition, some Y. pestis strains are capable of interfering with immune signaling (e.g., by preventing the release of some cytokines). Y. pestis proliferates inside lymph nodes, where it is able to avoid destruction by cells of the immune system such as macrophages. The ability of Y. pestis to inhibit phagocytosis allows it to grow in lymph nodes and cause lymphadenopathy. YopH is a protein tyrosine phosphatase that contributes to the ability of Y. pestis to evade immune system cells. In macrophages, YopH has been shown to dephosphorylate p130Cas, Fyb (Fyn binding protein) SKAP-HOM and Pyk, a tyrosine kinase homologous to FAK. YopH also binds the p85 subunit of phosphoinositide 3-kinase, the Gab1, the Gab2 adapter proteins, and the Vav guanine nucleotide exchange factor. YopE functions as a GTPase-activating protein for members of the Rho family of GTPases such as RAC1. YopT is a cysteine protease that inhibits RhoA by removing the isoprenyl group, which is important for localizing the protein to the cell membrane. It has been proposed that YopE and YopT may function to limit YopB/D-induced cytolysis. This might limit the function of YopB/D to create the pores used for Yop insertion into host cells and prevent YopB/D-induced rupture of host cells and release of cell contents that would attract and stimulate immune system responses. YopJ is an acetyltransferase that binds to a conserved α-helix of MAPK kinases. YopJ acetylates MAPK kinases at serines and threonines that are normally phosphorylated during activation of the MAP kinase cascade. YopJ is activated in eukaryotic cells by interaction with target cell Phytic acid (IP6). This disruption of host cell protein kinase activity causes apoptosis of macrophages, and it has been proposed that this is important for the establishment of infection and for evasion of the host immune response. YopO is a protein kinase also known as Yersinia protein kinase A (YpkA). YopO is a potent inducer of human macrophage apoptosis. Y. pestis is a versatile killer. In addition to rodents and humans, it is known to have killed dogs, cats, camels, chickens and pigs. A formalin-inactivated vaccine once was available in the United States for adults at high risk of contracting the plague until removal from the market by the Food and Drug Administration. It was of limited effectiveness and could cause severe inflammation. Experiments with genetic engineering of a vaccine based on F1 and V antigens are underway and show promise. However, bacteria lacking antigen F1 are still virulent, and the V antigens are sufficiently variable, such that vaccines composed of these antigens may not be fully protective. United States Army Medical Research Institute of Infectious Diseases (USAMRIID) have found that an experimental F1/V antigen-based vaccine protects crab-eating macaques but fails to protect African green monkey species. A systematic review by the Cochrane Collaboration found no studies of sufficient quality to make any statement on the efficacy of the vaccine. In 1894, two bacteriologists, Alexandre Yersin of Switzerland and Kitasato Shibasaburō of Japan, independently isolated in Hong Kong the bacterium responsible for the Third Pandemic. Though both investigators reported their findings, a series of confusing and contradictory statements by Kitasato eventually led to the acceptance of Yersin as the primary discoverer of the organism. Yersin named it Pasteurella pestis in honor of the Pasteur Institute, where he worked. In 1967 it was moved to a new genus and renamed Yersinia pestis in his honor. Yersin also noted that rats were affected by plague not only during plague epidemics but also often preceding such epidemics in humans and that plague was regarded by many locals as a disease of rats: villagers in China and India asserted that, when large numbers of rats were found dead, plague outbreaks soon followed. In 1898, the French scientist Paul-Louis Simond (who had also come to China to battle the Third Pandemic) established the rat-flea vector that drives the disease. He had noted that persons who became ill did not have to be in close contact with each other to acquire the disease. In Yunnan, China, inhabitants would flee from their homes as soon as they saw dead rats, and on the island of Formosa (Taiwan), residents considered the handling of dead rats heightened the risks of developing plague. These observations led him to suspect that the flea might be an intermediary factor in the transmission of plague, since people acquired plague only if they were in contact with recently dead rats, who had died less than 24 hours before. In a now classic experiment, Simond demonstrated how a healthy rat died of plague, after infected fleas had jumped to it, from a rat which had recently died of the plague. The outbreak spread to Chinatown, San Francisco from 1900-1904 and then to Oakland and the East Bay from 1907-1909. It has been present in the rodents of western North America ever since, as fear of the consequences of the outbreak on trade caused authorities to hide the dead of the Chinatown residents long enough for the disease to be passed to widespread species of native rodents in outlying areas. In 2018, the emergence and spread of the pathogen during the Neolithic Decline (as far back as 6,000 years ago) was published. A site in Sweden was the source of the DNA evidence and trade networks were proposed as the likely avenue of spread rather than migrations of populations. DNA evidence published in 2015 indicates Y. pestis infected humans 5,000 years ago in Bronze Age Eurasia, but genetic changes that made it highly virulent did not occur until about 4,000 years ago. The highly virulent version capable of transmission by fleas through rodents, humans, and other mammals was found in two individuals associated with the Srubnaya culture from the Samara region in Russia from around 3,800 years ago and an Iron Age individual from Kapan, Armenia from around 2,900 years ago. This indicates that there were at least two lineages of Y. pestis circulating during the Bronze Age in Eurasia. The Y. pestis bacterium has a relatively large number of non-functioning genes and three "ungainly" plasmids suggesting a recent origin less than 20,000 years ago. Three main strains are recognised: Antiqua, which caused a plague pandemic in the sixth century; Medievalis, which caused the Black Death and subsequent epidemics during the second pandemic wave; and Orientalis, which is responsible for current plague outbreaks. Plague causes a blockage in the proventriculus of the flea by forming a biofilm. The biofilm formation is induced by the ingestion of blood. The presence of a biofilm seems likely to be required for stable infection of the flea. It has been suggested that a bacteriophage – Ypφ – may have been responsible for increasing the virulence of this organism. In 2008 the plague was commonly found in sub-Saharan Africa and Madagascar, areas which accounted for over 95% of the reported cases. In September 2009, the death of Malcolm Casadaban, a molecular genetics professor at the University of Chicago, was linked to his work on a weakened laboratory strain of Y. pestis. Hemochromatosis was hypothesised to be a predisposing factor in Casadaban's death from this attenuated strain used for research. In 2012, researchers in Germany collected samples of Yersinia pestis from gravesites with a view to reconstructing the DNA of the bacterium. In 2015, Cell published results from a study of ancient graves. Plasmids of Y. pestis were detected in archaeological samples of the teeth of seven Bronze Age individuals, in the Afanasievo culture in Siberia, the Corded Ware culture in Estonia, the Sintashta culture in Russia, the Unetice culture in Poland and the Andronovo culture in Siberia. On June 8, 2015 in Larimer County, CO, a fatality was confirmed by the CDC as listed on the RSOE EDIS – Emergency and Disaster Information Service. September 8, 2016: Yersinia pestis bacterium identified from DNA in teeth from skeletons found at Crossrail Site, London showing the human remains were victims of the Great Plague of London in 1665-1666. January 15, 2018: While rats have long been blamed for spreading the fatal disease throughout Europe, researchers at the University of Oslo in Norway and the University of Ferrara in Italy now believe humans and their parasites were the biggest carriers. ^ Sutyak, Katya. "Yersinia Pestis." University of Connecticut, 10 Nov. 2015. ^ a b Ryan KJ, Ray CG, eds. (2004). Sherris Medical Microbiology (4th ed.). McGraw Hill. pp. 484–488. ISBN 978-0-8385-8529-0. ^ a b hunnomad@gmail.com, Zsolt Boszormenyi-. "RSOE EDIS - - Event reports (Earthquakes, events, tropical storms, tsunamies and others)". RSOE EDIS. Retrieved 11 December 2018. ^ Harbeck, Michaela; Seifert, Lisa; Hänsch, Stephanie; Wagner, David M.; Birdsell, Dawn; Parise, Katy L.; Wiechmann, Ingrid; Grupe, Gisela; Thomas, Astrid; Keim, Paul; Zöller, Lothar; Bramanti, Barbara; Riehm, Julia M.; Scholz, Holger C. (2013). "Yersinia pestis DNA from Skeletal Remains from the 6th Century AD Reveals Insights into Justinianic Plague | Science. New SeriesPLoS Pathogens". PLoS Pathogens. 9 (#5): e1003349. doi:10.1371/journal.ppat.1003349. PMC 3642051. PMID 23658525. Lay summary – ScienceDaily (May 10, 2013). ^ Carter, Adam (January 27, 2014). "Black Death mysteries unlocked by McMaster scientists". CBC News. ^ a b Nicholas Wade (October 31, 2010). "Europe's Plagues Came From China, Study Finds". New York Times. Retrieved November 1, 2010. ^ Morelli, G.; Song, Y.; Mazzoni, C.J. ; Eppinger, M.; Roumagnac, P.; Wagner, D.M. ; Feldkamp, M.; Kusecek, B.; Vogler, A.J. ; Li, Y.; Cui, Y.; Thomson, N.R. ; Jombart, T.; Leblois, R.; Lichtner, P.; Rahalison, L.; Petersen, J.M. ; Balloux, F.; Keim, Pl; Wirth, T.; Ravel, J.; Yang, R.; Carniel, E.; Achtman, M. (December 2010). "Yersinia pestis genome sequencing identifies patterns of global phylogenetic diversity". Nature Genetics. 42 (#12): 1140–1143. doi:10.1038/ng.705. PMC 2999892. PMID 21037571. ^ Bockemühl J (1994). "100 years after the discovery of the plague-causing agent – importance and veneration of Alexandre Yersin in Vietnam today". Immun Infekt. 22 (#2): 72–75. PMID 7959865. ^ Howard-Jones N (1973). "Was Kitasato Shibasaburō the discoverer of the plague bacillus?". Perspect Biol Med. 16 (#2): 292–307. doi:10.1353/pbm.1973.0034. PMID 4570035. ^ a b Collins FM (1996). Baron S; et al. (eds.). Pasteurella, Yersinia, and Francisella. In: Baron's Medical Microbiology (4th ed.). Univ. of Texas Medical Branch. ISBN 978-0-9631172-1-2. ^ Stackebrandt, Erko; Dworkin, Martin; Falkow, Stanley; Rosenberg, Eugene; Karl-Heinz Schleifer (2005). The Prokaryotes: A Handbook on the Biology of Bacteria: Volume 6: Proteobacteria: Gamma Subclass. Berlin: Springer. ISBN 978-0-387-25499-9. ^ Deng, W.; Burland, V.; Plunkett III, G.; Boutin, A.; Mayhew, G.F.; Liss, P.; Perna, N.T. ; Rose, D.J. ; Mau, B.; Zhou, S.; Schwartz, D.C.; Fetherston, J.D. ; Lindler, L.E. ; Brubaker, R.R. ; Plano, G.V. ; Straley, S.C.; McDonough, K.A. ; Nilles, M.L. ; Matson, J.S. ; Blattner, F.R. ; Perry, R.D. (August 2002). "Genome sequence of Yersinia pestis KIM". Journal of Bacteriology. 184 (#16): 4601–4611. doi:10.1128/JB.184.16.4601-4611.2002. PMC 135232. PMID 12142430. ^ Parkhill, J.; Wren, B.W. ; Thomson, N.R. ; Titball, R.W. ; Holden, H.T. ; Prentice, M.B. ; Sebaihia, M.; James, K.D. ; Churcher, C.; Mungall, K.L. ; Baker, S.; Basham, D.; Bentley, S.D. ; Brooks, K.; Cerdeño-Tárraga, A.M.; Chillingworth, T.; Cronin, A.; Davies, R.M. ; Davis, P.; Dougan, G.; Feltwell, T.; Hamlin, N.; Holroyd, S.; Jagels, K.; Karlyshev, A.V. ; Leather, S.; Moule, S.; Oyston, P.C. ; Quail, M.; Rutherford, K.; Simmonds, M.; Skelton, J.; Stevens, K.; Whitehead, S.; Barrell, B.G. (October 2001). "Genome sequence of Yersinia pestis, the causative agent of plague". Nature. 413 (#6, 855): 523–527. doi:10.1038/35097083. PMID 11586360. ^ Chain PS, Hu P, Malfatti SA, et al. (2006). "Complete Genome Sequence of Yersinia pestis Strains Antiqua and Nepal 516: Evidence of Gene Reduction in an Emerging Pathogen". J. Bacteriol. 188 (#12): 4453–4463. doi:10.1128/JB.00124-06. PMC 1482938. PMID 16740952. ^ a b Hinnebusch BJ, Rudolph AE, Cherepanov P, Dixon JE, Schwan TG, Forsberg A (2002). "Role of Yersinia murine toxin in survival of Yersinia pestis in the midgut of the flea vector". Science. 296 (#5, 568): 733–735. Bibcode:2002Sci...296..733H. doi:10.1126/science.1069972. PMID 11976454. ^ a b Lathem WW, Price PA, Miller VL, Goldman WE (2007). "A plasminogen-activating protease specifically controls the development of primary pneumonic plague". Science. 315 (#5, 811): 509–513. Bibcode:2007Sci...315..509L. doi:10.1126/science.1137195. PMID 17255510. ^ Hixson, K.K. ; Adkins, J.N. ; Baker, S.E. ; Moore, R.J.; Chromy, B.A. ; Smith, R.D. ; McCutchen-Maloney, S.L. ; Lipton, M.S. (November 2006). "Biomarker candidate identification in Yersinia pestis using organism-wide semiquantitative proteomics". Journal of Proteome Research. 5 (#11): 3008–3017. doi:10.1021/pr060179y. PMID 17081052. ^ Schiano, Chelsea A.; Koo, Jovanka T.; Schipma, Matthew J.; Caulfield, Adam J.; Jafari, Nadereh; Lathem, Wyndham W. (2014-05-01). "Genome-wide analysis of small RNAs expressed by Yersinia pestis identifies a regulator of the Yop-Ysc type III secretion system". Journal of Bacteriology. 196 (#9): 1659–1670. doi:10.1128/JB.01456-13. ISSN 1098-5530. PMC 3993326. PMID 24532772. ^ Cornelis, G. R.; Boland, A.; Boyd, A. P.; Geuijen, C.; Iriarte, M.; Neyt, C.; Sory, M. P.; Stainier, I. (1998-12-01). "The virulence plasmid of Yersinia, an antihost genome". Microbiology and Molecular Biology Reviews. 62 (#4): 1315–1352. ISSN 1092-2172. PMC 98948. PMID 9841674. ^ Yan, Yanfeng; Su, Shanchun; Meng, Xiangrong; Ji, Xiaolan; Qu, Yi; Liu, Zizhong; Wang, Xiaoyi; Cui, Yujun; Deng, Zhongliang (2013). "Determination of sRNA expressions by RNA-seq in Yersinia pestis grown in vitro and during infection". PLOS ONE. 8 (#9): e74495. Bibcode:2013PLoSO...874495Y. doi:10.1371/journal.pone.0074495. ISSN 1932-6203. PMC 3770706. PMID 24040259. ^ Meyer K.F. (1957). "The natural history of plague and psittacosis: The R. E. Dyer Lecture". Public Health Reports. 72 (#8): 705–719. doi:10.2307/4589874. JSTOR 4589874. PMC 2031327. PMID 13453634. ^ von Reyn CF, Weber NS, Tempest B, et al. (1977). "Epidemiologic and clinical features of an outbreak of bubonic plague in New Mexico". J. Infect. Dis. 136 (#4): 489–494. doi:10.1093/infdis/136.4.489. PMID 908848. ^ Pauli JN, Buskirk SW, Williams ES, Edwards WH (2006). "A plague epizootic in the black-tailed prairie dog (Cynomys ludovicianus)". J. Wildl. Dis. 42 (#1): 74–80. doi:10.7589/0090-3558-42.1.74. PMID 16699150. ^ Webb CT, Brooks CP, Gage KL, Antolin MF (2006). "Classic flea-borne transmission does not drive plague epizootics in prairie dogs". Proc. Natl. Acad. Sci. USA. 103 (#16): 6236–6241. Bibcode:2006PNAS..103.6236W. doi:10.1073/pnas.0510090103. PMC 1434514. PMID 16603630. ^ Bertherat, E.; Bekhoucha, S.; Chougrani, S.; Razik, F.; Duchemin, J.B.; Houti, L.; Deharib, L.; Fayolle, C.; Makrerougrass, B.; Dali-Yahia, R.; Bellal, R.; Belhabri, L.; Chaieb, A.; Tikhomirov, E.; Carniel, E. (October 2007). "Plague reappearance in Algeria after 50 years, 2003". Emerging Infectious Diseases. 13 (#10): 1459–1462. doi:10.3201/eid1310.070284. PMC 2851531. PMID 18257987. ^ "Cats – Healthy Pets Healthy People". Centers for Disease Control and Prevention. 2016-05-13. Retrieved 2016-11-25. ^ Zhou D, Han Y, Yang R (2006). "Molecular and physiological insights into plague transmission, virulence and etiology". Microbes Infect. 8 (#1): 273–284. doi:10.1016/j.micinf.2005.06.006. PMID 16182593. ^ B.J. Hinnebusch; R.D. Perry & T.G. Schwan (1996). "Role of the Yersinia pestis hemin storage (hms) locus in the transmission of plague by fleas". Science. 273 (#5, 237): 367–370. Bibcode:1996Sci...273..367H. doi:10.1126/science.273.5273.367. PMID 8662526. ^ Erickson, D. L.; N. R. Waterfield; V. Vadyvaloo; D. Long; E. R. Fischer; R. Ffrench-Constant & B. J. Hinnebusch (2007). "Acute oral toxicity of Yersinia pseudotuberculosis to fleas: Implications for the evolution of vector-borne transmission of plague". Cellular Microbiology. 9 (#11): 2658–2666. doi:10.1111/j.1462-5822.2007.00986.x. PMID 17587333. ^ Pepper, C.; Nascarella, M.; Marsland, E.; Montford, J.; Wood, L.; Cox, S.; Bradford, C.; Burns, T.; Presley, S. (2004). "Threatened or endangered? Keystone species or public health threat? The black-tailed prairie dog, the Endangered Species Act, and the imminent threat of bubonic plague". Journal of Land, Resources, and Environmental Law. 24: 355–391. ^ Salyers AA, Whitt DD (2002). Bacterial Pathogenesis: A Molecular Approach (2nd ed.). ASM Press. pp. 207–212. ^ Viboud GI, Bliska JB (2005). "Yersinia outer proteins: role in modulation of host cell signaling responses and pathogenesis". Annu. Rev. Microbiol. 59 (#1): 69–89. doi:10.1146/annurev.micro.59.030804.121320. PMID 15847602. ^ de la Puerta ML, Trinidad AG, del Carmen Rodríguez M, Bogetz J, Sánchez Crespo M, Mustelin T, Alonso A, Bayón Y (February 2009). Bozza P (ed.). "Characterization of New Substrates Targeted By Yersinia Tyrosine Phosphatase YopH". PLoS ONE. 4 (#2): e4431. Bibcode:2009PLoSO...4.4431D. doi:10.1371/journal.pone.0004431. PMC 2637541. PMID 19221593. ^ Mejía E, Bliska JB, Viboud GI (February 2009). "Yersinia Controls Type III Effector Delivery into Host Cells by Modulating Rho Activity". PLoS ONE. 4 (#2): e4431. doi:10.1371/journal.ppat.0040003. PMC 2186360. PMID 18193942. ^ Hao YH, Wang Y, Burdette D, Mukherjee S, Keitany G, Goldsmith E, Orth K (January 2008). Kobe B (ed.). "Structural Requirements for Yersinia YopJ Inhibition of MAP Kinase Pathways". PLoS ONE. 3 (#1): e1375. Bibcode:2008PLoSO...3.1375H. doi:10.1371/journal.pone.0001375. PMC 2147050. PMID 18167536. ^ Mukherjee, S.; Keitany, Gladys; Li, Yan; Wang, Yong; Ball, Haydn L.; Goldsmith, Elizabeth J.; Orth, Kim (2006). "Yersinia YopJ Acetylates and Inhibits Kinase Activation by Blocking Phosphorylation". Science. 312 (#5, 777): 1211–1214. Bibcode:2006Sci...312.1211M. doi:10.1126/science.1126867. PMID 16728640. ^ Mittal, R.; Peak-Chew, S.-Y. ; McMahon, H. T. (2006). "Acetylation of MEK2 and I B kinase (IKK) activation loop residues by YopJ inhibits signaling". Proceedings of the National Academy of Sciences. 103 (#49): 18574–18579. Bibcode:2006PNAS..10318574M. doi:10.1073/pnas.0608995103. PMC 1654131. PMID 17116858. ^ Mittal R, Peak-Chew SY, Sade RS, Vallis Y, McMahon HT (2010). "The Acetyltransferase Activity of the Bacterial Toxin YopJ of Yersinia Is Activated by Eukaryotic Host Cell Inositol Hexakisphosphate". J Biol Chem. 285 (#26): 19927–19934. doi:10.1074/jbc.M110.126581. PMC 2888404. PMID 20430892. ^ Park H, Teja K, O'Shea JJ, Siegel RM (May 2007). "The Yersinia effector protein YpkA induces apoptosis independently of actin depolymerization". J. Immunol. 178 (#10): 6426–6434. doi:10.4049/jimmunol.178.10.6426. PMID 17475872. ^ a b Kelly, John (2005). Great mortality : an intimate history of the Black Death (1st ed.). London [u.a. ]: Fourth Estate. p. 35. ISBN 978-0007150694. ^ Welkos S, et al. (2002). "Determination of the virulence of the pigmentation-deficient and pigmentation-/plasminogen activator-deficient strains of Yersinia pestis in non-human primate and mouse models of pneumonic plague". Vaccine. 20 (#17–18): 2206–2214. doi:10.1016/S0264-410X(02)00119-6. PMID 12009274. ^ Pitt ML (October 2004). "Non-human primates as a model for pneumonic plague. In: Animals Models and Correlates of Protection for Plague Vaccines Workshop" (PDF). ^ Jefferson T, Demicheli V, Pratt M (2000). Jefferson T (ed.). "Vaccines for preventing plague". Cochrane Database Syst Rev (#2): CD000976. doi:10.1002/14651858.CD000976. PMID 10796565. ^ "The Plague". Association Amicale Sante Navale et d'Outremer. Archived from the original on 4 September 2012. ^ Chase, M. (2004). The Barbary Plague: The Black Death in Victorian San Francisco. Random House Trade Paperbacks. ^ a b Rasmussen, Simon; Allentoft, Morten Erik; Nielsen, Kasper; Orlando, Ludovic; Sikora, Martin; Sjögren, Karl-Göran; Pedersen, Anders Gorm; Schubert, Mikkel; Van Dam, Alex; Kapel, Christian Moliin Outzen; Nielsen, Henrik Bjørn; Brunak, Søren; Avetisyan, Pavel; Epimakhov, Andrey; Khalyapin, Mikhail Viktorovich; Gnuni, Artak; Kriiska, Aivar; Lasak, Irena; Metspalu, Mait; Moiseyev, Vyacheslav; Gromov, Andrei; Pokutta, Dalia; Saag, Lehti; Varul, Liivi; Yepiskoposyan, Levon; Sicheritz-Pontén, Thomas; Foley, Robert A.; Lahr, Marta Mirazón; Nielsen, Rasmus; Kristiansen, Kristian; Willerslev, Eske (2015). "Early Divergent Strains of Yersinia pestis in Eurasia 5,000 Years Ago". Cell. 163 (#3): 571–582. doi:10.1016/j.cell.2015.10.009. ISSN 0092-8674. PMC 4644222. PMID 26496604. ^ a b c Spyrou, Maria A.; Tukhbatova, Rezeda I.; Wang, Chuan-Chao; a; Lankapalli, Aditya K.; Kondrashin, Vitaly V.; Tsybin, Victor A.; Khokhlov, Aleksandr; hnert; Herbig, Alexander; Bos, Kirsten I.; Krause, Johannes (2018-06-08). 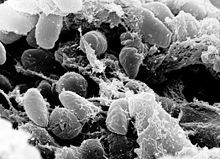 "Analysis of 3800-year-old Yersinia pestis genomes suggests Bronze Age origin for bubonic plague". Nature Communications. 9 (#1): 2234. doi:10.1038/s41467-018-04550-9. ISSN 2041-1723. PMC 5993720. PMID 29884871. ^ Achtman, M; Zurth, K; Morelli, G; Torrea, G; Guiyoule, A; Carniel, E (1999). "Yersinia pestis, the cause of plague, is a recently emerged clone of Yersinia pseudotuberculosis". Proc Natl Acad Sci USA. 96 (#24): 14043–14048. Bibcode:1999PNAS...9614043A. doi:10.1073/pnas.96.24.14043. PMC 24187. PMID 10570195. ^ Jarrett, CO; Deak, E; Isherwood, KE; Oyston, PC; Fischer, ER; Whitney, AR; Kobayashi, SD; DeLeo, FR; Hinnebusch, BJ (2004). "Transmission of Yersinia pestis from an infectious biofilm in the flea vector". J Infect Dis. 190 (#4): 783–792. doi:10.1086/422695. PMID 15272407. ^ Erickson DL1, Jarrett CO; Wren, BW; Hinnebusch, BJ (2006). "Serotype differences and lack of biofilm formation characterize Yersinia pseudotuberculosis infection of the Xenopsylla cheopis flea vector of Yersinia pestis". J Bacteriol. 188 (#3): 1113–1119. doi:10.1128/jb.188.3.1113-1119.2006. PMC 1347331. PMID 16428415. ^ Derbise, A; Chenal-Francisque, V; Pouillot, F; Fayolle, C; Prévost, MC; Médigue, C; Hinnebusch, BJ; Carniel, E (2007). "A horizontally acquired filamentous phage contributes to the pathogenicity of the plague bacillus". Mol Microbiol. 63 (#4): 1145–1157. doi:10.1111/j.1365-2958.2006.05570.x. PMID 17238929. ^ Sadovi, Carlos (2009-09-19). "U. of C. researcher dies after exposure to plague bacteria". Chicago Breaking News Center. Retrieved 2010-03-03. ^ Randall, Tom (Feb 25, 2011). "Plague Death Came Within Hours, Spurred by Scientist's Medical Condition". ^ Harbeck M, Seifert L, Hänsch S, et al. (2013). "Yersinia pestis DNA from skeletal remains from the 6th century AD reveals insights into Justinianic Plague". PLoS Pathogens. 9 (#5): e1003349. doi:10.1371/journal.ppat.1003349. PMC 3642051. PMID 23658525. ^ Rasmussen, Simon; Allentoft, Morten Erik; Nielsen, Kasper; Orlando, Ludovic; Sikora, Martin; Sjögren, Karl-Göran; Pedersen, Anders Gorm; Schubert, Mikkel; Van Dam, Alex; Kapel, Christian Moliin Outzen; Nielsen, Henrik Bjørn; Brunak, Søren; Avetisyan, Pavel; Epimakhov, Andrey; Khalyapin, Mikhail Viktorovich; Gnuni, Artak; Kriiska, Aivar; Lasak, Irena; Metspalu, Mait; Moiseyev, Vyacheslav; Gromov, Andrei; Pokutta, Dalia; Saag, Lehti; Varul, Liivi; Yepiskoposyan, Levon; Sicheritz-Pontén, Thomas; Foley, Robert A.; Lahr, Marta Mirazón; Nielsen, Rasmus; et al. (2015). "Early Divergent Strains of Yersinia pestis in Eurasia 5,000 Years Ago". Cell. 163 (#3): 571–582. doi:10.1016/j.cell.2015.10.009. PMC 4644222. PMID 26496604. ^ "DNA of bacteria responsible for London Great Plague of 1665 identified for first time". ^ "Don't blame the rats: Human fleas and lice likely spread Black Death". CBC News. ^ Dean, Katharine R; Krauer, Fabienne; Walløe, Lars; Lingjærde, Ole Christian; Bramanti, Barbara; Stenseth, Nils Chr; Schmid, Boris V (2018). "Human ectoparasites and the spread of plague in Europe during the Second Pandemic". Proceedings of the National Academy of Sciences. 115 (#6): 1304–1309. doi:10.1073/pnas.1715640115. PMC 5819418. PMID 29339508.